Another 6″x6″ page for the recipe swap. This recipe page is for Pumpkin Chocolate Chip Cookies (with Cream Cheese frosting). If you are interested in the cookie recipe, you can find it here. And if you are interested in the Cricut recipe, you can find it here. This page uses the new “Create a Critter 2” pilgrim squirrel (cut at 2.25 inches tall). The squirrel popping out for the cookie jar is also from “Create a Critter 2” although her cap is from Everyday Paper Doll Dress Up. I used Cricut Craft Room (CCR) to size the cap to fit the squirrel. The cookie jar is actually the vase from “Walk in My Garden”. I used CCR to re-size the vase a little wider than the original cut. I made the cookie jar lid by welding a rectangle and a circle together and then sizing to fit the jar. The pumpkin label on the cookie jar is from “Create a Critter” and Cricut Essentials. And the little leaves floating about are also from “Create a Critter”. I made the “cookie title” by printing and then punching with a 1.75″ circle and then taking bites out with a 1/2 inch circle. A little Tim Holtz Distress Ink in Wild Honey adds more dimension as does the Glossy Accents on the nose and eyes. Super cute!! Now I’m off to check out that cookie recipe…YUM!!! This is so sweet! I love the shiny noses and perfect hats! I love the partially-eaten cookie title! Perfect prints and accents— and I love the little leaves! I’ve been waiting for you to post this!! It is just too cute. I love all the wonderful details and especially your paper choices. And thanks for the link to the recipe. Yum! I love everything about this recipe card. The falling leaves, the critters with shiny noses, the pumpkin, the jar. The cute smiles on each face says it all. This is a fun card. This is impossible to believe, but even cuter in person! Absolutely adore the whole concept of this page. 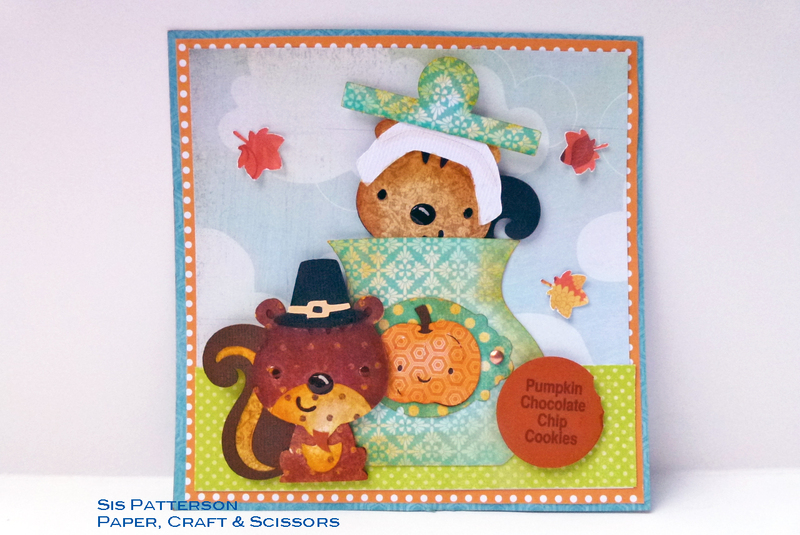 The papers are fabulous, the pilgrim hat on the peek a boo squirrel is genius and adorable! The inking and shading is fabulous. Can’t wait to try this recipe too. Sis, you are the queen of these recipe pages. Absolutely fabulous!